For Kamau Brathwaite and Allen Ginsberg, I made white silk scarves, as befitting elders of the edgy, risk-taking poetry community of the Americas and beyond; Kamau responded w/ a “’Nansi photograph” which turned out to be central to his most recent book, Born to Slow Horses, in which spirit photography of a spider that turns into a ghost slave woman comprises the crux and climax. I don't have a photo of that one. Ginsberg incorporated the gift of the white silk scarf into the final ad libbed portion of his 1994 reading at the University of St. Thomas, a Minneapolis college known primarily for its business programs and a few other professional training programs such as its teaching certification programs and so forth. 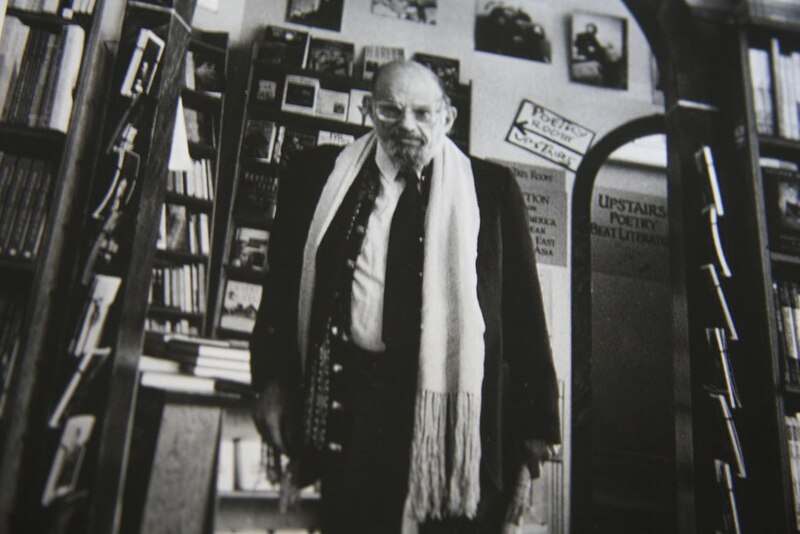 Because of this reputation for commodity and commodification, the deeply Christian St. Thomas wanted to boost its image in the humanities by inviting the best-known poet in the United States, the pedophilic, Jewish socialist Buddhist Allen Ginsberg, without fully realizing what they were in for. It had been Ginsberg’s habit to make connections with attractive young men during the course of his readings and gigs across the country, and as he grew older his loneliness became more apparent and his entreaties more direct, though he had never been shy about this to begin with. At the conclusion of this reading, Ginsberg, accompanying himself on the harmonium as usual, burst into an extended and extemporized riff on his stay so far, which included a plea to the audience to buy an extravagantly priced ($500) special, hand-printed and silkscreened Coffee House Press edition of a small book chronicling his first encounter with Peter Orlovsky, an accounting of the gift of a “brand-new white silk scarf” in the parking lot of the auditorium, and a last-ditch offer that any interested young men who wanted to share his bed that evening meet him immediately after the reading at his book-signing station in the auditorium lobby. Audience members responded with a range of delight, horror and amusement; they were getting the real thing, the undiluted arts and humanities. In the summer of 1995, I saw Allen at Naropa University’s summer Writing Program, and in the course of a dinner hosted by Lee Ann Brown and Steven Taylor mentioned the scarf to him. Yes, he said; he’d had that scarf for quite a long time. I’m not sure what that meant, but I was touched that he wanted me to believe he remembered it at all. The grandiosity of my faith in the aura of a handmade (by me) textile was not especially tested, because the aura resides in something beyond the particulars of personal exchange. Years later (2008) I was at the MLA convention in San Francisco; I strolled over to City Lights Books to cruise their amazing selection of books, of which, to quote Ring Lardner (? ), they have a full set. Browsing through a nice coffeetable book of Chris Felver’s photos of elderly beat writers, I found to my astonishment two of Allen wearing the scarf and standing iconically in the arched doorway of City Lights. You can imagine the handworker’s secret thrill that surged through me, now publicly acknowledged to you all, secret no more. Of course I bought the book and showed everyone I could corner.